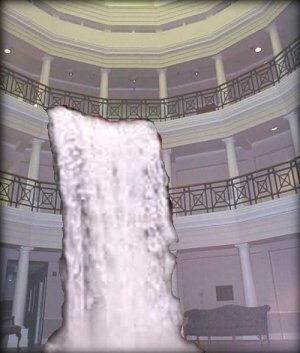 NMRH -- In an unexpected turn of events, the highly anticipated New Women’s waterfall finally made its campus debut on the morning of Friday, December 1, 2000, bringing about the end of an era here at [the largest college in the Clinton area]. However, school administrators were left speechless when it was discovered that the waterfall was not placed in its pre-assigned position between the New Women’s towers but was mistakenly installed inside the New Men’s Rotunda. At this point, witnesses report observing a spectacle of epic proportions-the entire school administration charging hysterically down the hill on the east side of Hederman Dorm, some losing their footing, thereby being trampled under by the angry mob. Unfortunately, the waterfall construction supervisor ordered the command, “Go!” just as the frenzied faculty members reached the bottom of the hill, causing an incalculable amount of water to be pumped into the Holloway Rotunda at an incredible rate of speed. 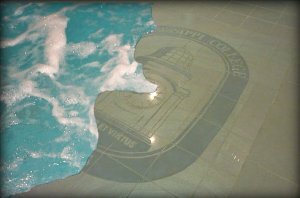 The New Men’s Resident Director, who was making his way through the Rotunda at the time of waterfall initiation, was caught by surprise by the massive wall of water and could only respond, “AH!” before he was swept away by the swift current. Some dorm residents observed the hazardous conditions before leaving their rooms and ventured to class only through the use of rafts, canoes, and paddleboats. Several students were even seen with kayaks. 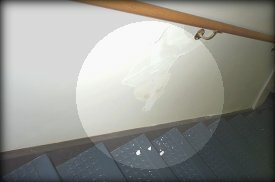 The more unfortunate residents were terror-stricken as the powerful force of rising waters burst their doors clean off the hinges, ruining their rooms as well as all of their personal possessions. Following the disaster, maintenance crews mopped the dorm for 53 hours straight. 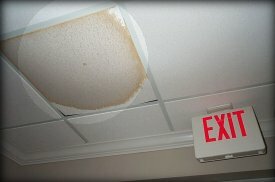 Ceiling tile (above) and sheetrock damage (below) was prevalent, especially in the east stairwell. The above article was intended for parody purposes only.